Coffee. It is the way the majority of adults I know get their days started and how they can function when they drag themselves out of bed in the early morning. I absolutely love coffee but I also know that, at the end of the day, it is the caffeine my body really craves (and is addicted to!). I generally start my day with a 20 oz cup of coffee (591 ml) and if I don’t have it I can expect a headache by noon. First of all, this was not the first time I have replaced my coffee with a different caffeine source. Often, when I know I have to wake up super early or will be in a rush to get somewhere I will pick up a bottle of soda or a can of energy drink to get my morning caffeine fix. But a whole month without coffee in the morning? I had never done that before! 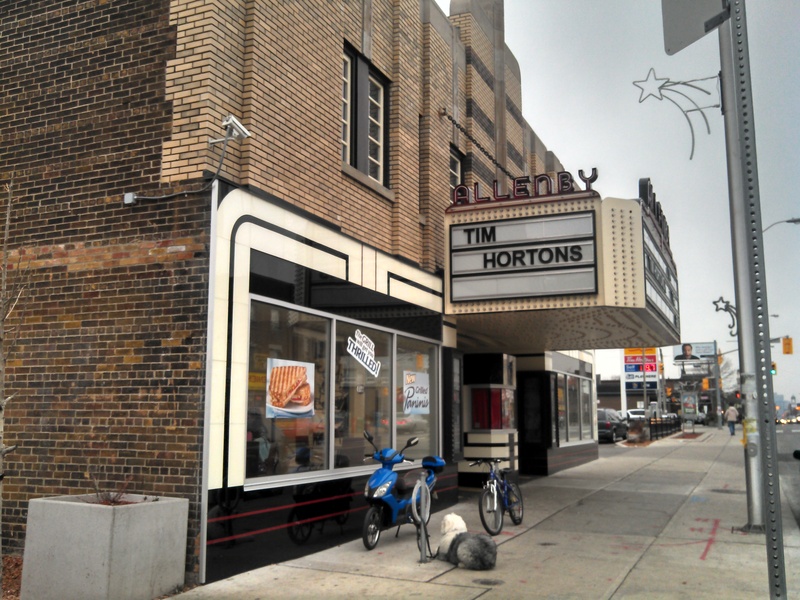 A while back I was driving down Danforth Avenue and I passed an Esso & Tim Hortons which was – to say the least – different from most every other I have seen. The address for this building is 1213 Danforth Ave (map). Looking from the east side of the building. 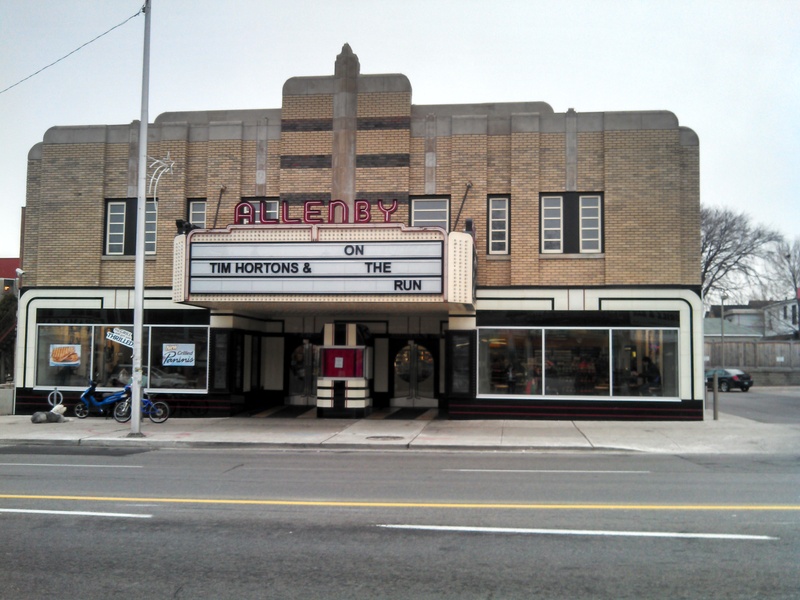 The Allenby Theatre (more recently known as the Roxy Theatre), was constructed in 1935 by the partnership of Kaplan and Sprachman, the firm responsible for between 70 and 80% of all movie theatres constructed in Canada between 1921 and 1950. Pretty interesting redevelopment of an old building isn’t it? I love finding these cool little things in a city and if you know of any in Toronto/The Greater Toronto Area you think I should check out let me know! Also, if you or your family members have any memories of going to the Roxy/Allenby I would really love to read them in the comments below. I went by a local Tim Hortons for a first time in a while this AM – usually I just make my coffee using the tin and a filter at home or work and saw the sign you see on the door above, much to my delight. This was apparently announced in mid November as per the press release here. 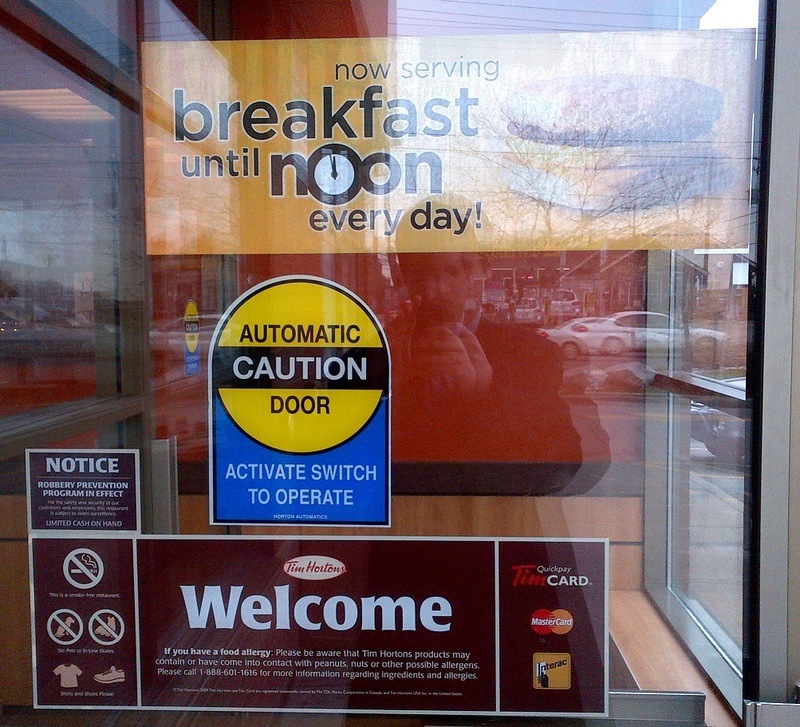 According to Donna Finelli, Director, Brand Marketing for food at Tim Hortons in the press release, “We heard from our restaurant owners that many times guests would come in and ask for breakfast beyond 11 am only to find they had missed the window. We felt we needed to respond to our guests’ needs.” This, in my opinion, is the reality in our new world ever changed by technology. So many of us telecommute or work from home that “breakfast time” is no longer a fast and hard specific period in the morning it can happen anytime of the day or night. Also, we are used to having every option in the world available to us so why limit us to getting something during specific hours – it isn’t as if they deliver those biscuits they use for the breakfast sandwich from Tim Hortons head office every morning at 5am. This is another. 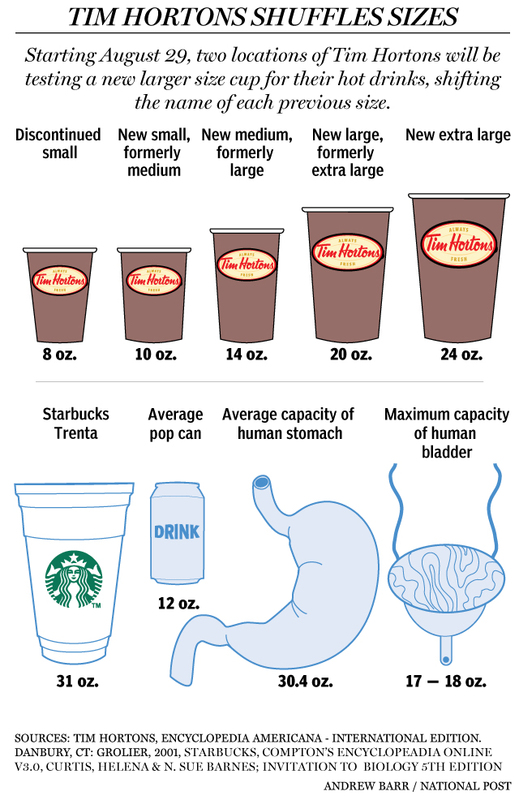 in my mind welcome, change since they introduced a larger size cup in test markets in August – although we haven’t seen that spread to a wider area since. I have been saying that they needed to do this for years – pretty much since they introduced their breakfast – although I never said they should be extending their hours across all their stores. My idea was always to extend the hours in locations which were on university or college campuses because, let’s be honest, students in post-secondary institutions decidedly do not obey the rules of normal hours. SERVE BREAKFAST ALL DAY EVERY DAY! It’s that simple. People sometimes like to have their breakfast whenever and it shouldn’t really be SUCH a big deal to have it available all the time – in my opinion. Granted I haven’t done any research and don’t know any of the costs associated but this is my blog so I can say whatever I want. Also, the way I figure it, if Dunkin’ Donuts locations do it across the USA then it can’t be such a big deal. This is a post I am writing after my road trip to the Syracuse, NY area – as I mentioned yesterday, I was there for the weekend. 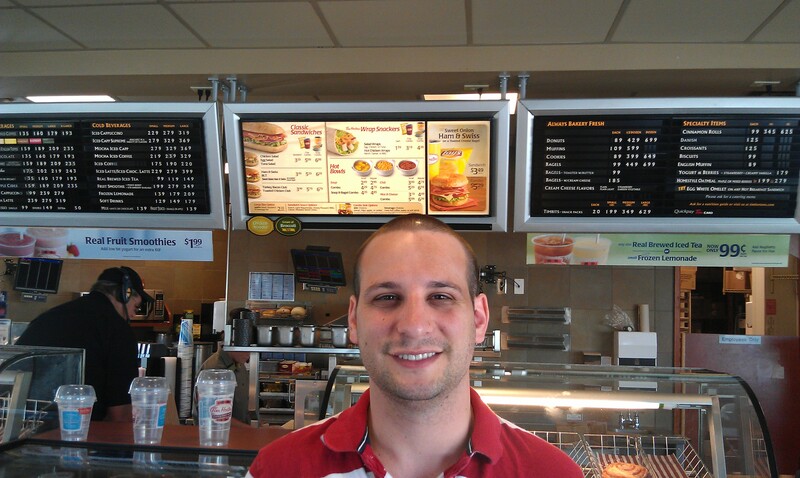 While in Syracuse I, being a Tim Hortons coffee drinker in Toronto (although I do frequent many other coffee houses, Tim Hortons is a good, simple go-to) I was delighted to find that there was one relatively close to our hotel in Syracuse, NY. But, as The Simpsons mentioned when they ripped off Pulp Fiction, it’s the little differences when you go to a popular place in a different country (or in The Simpsons’ case, city). 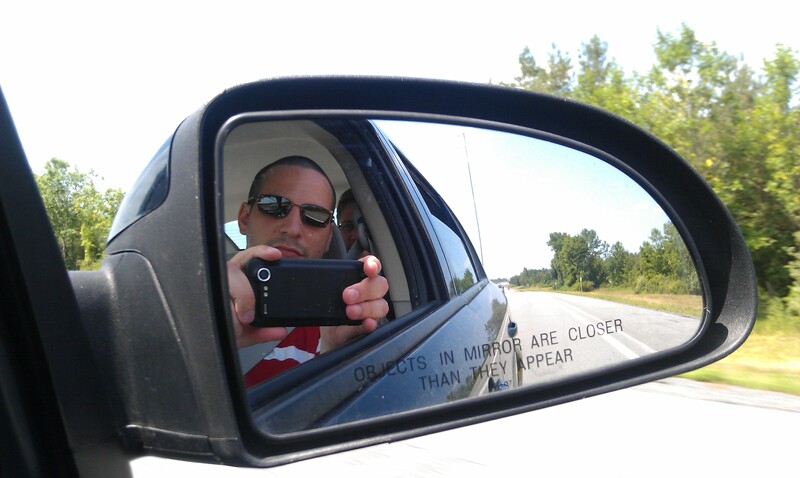 As an example of what I mean by this check out this picture of me below.